A second Boston resident has been diagnosed with West Nile virus , just days after the state’s Department of Public Health raised the risk level for the disease from moderate to high in several Greater Boston communities, health officials said Friday. The victim is a 50-year-old man, and his case represents the fifth diagnosis in a Massachusetts resident this year, the Boston Public Health Commission said in a statement. A woman in her 50s was diagnosed with the disease Monday, and the first three human cases in the state this year were reported on Aug. 24, DPH spokeswoman Ann Scales said in a statement Monday. Six Massachusetts residents were diagnosed with the virus in 2017. The 11 communities facing a high risk of the virus this summer are Arlington, Boston, Belmont, Brookline, Cambridge, Chelsea, Everett, Medford, Newton, Somerville, and Watertown, health officials said. The virus is typically transmitted to humans via infected mosquitoes, which live near and spawn in pools of standing water. Most people infected with West Nile virus never experience symptoms, but those who do can develop a fever, fatigue, vomiting, body aches, and rashes, according to the Centers for Disease Control and Prevention. The number of mosquito pools that tested positive for the virus in Suffolk County rose to 15 this week, health officials said. 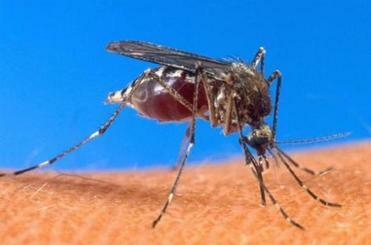 West Nile virus has arrived in Massachusetts. Flipping over wading pools and inspecting your window screens can help keep your home safe from mosquitoes that spread it. With the number of reported cases rising in recent days, state and city health officials are urging people to take precautions to protect themselves and to mitigate the further spread of the disease. “Residents are strongly urged to take steps to protect themselves, their loved ones, and pets from mosquito bites,” the health commission said. People are advised to use EPA-approved insect repellents, wear clothing that reduces skin exposure, and install or repair window screens to keep mosquitoes outside the home. Massachusetts residents are also being asked to treat large pools of water on their property with larvicide and to dump any standing water to prevent mosquitoes from breeding.